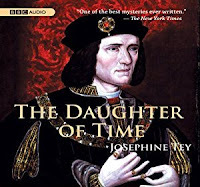 The Daughter of Time (1951) was, I think, the very first novel I read by Josephine Tey (aka Elizabeth Mackintosh) long ago from my hometown library. 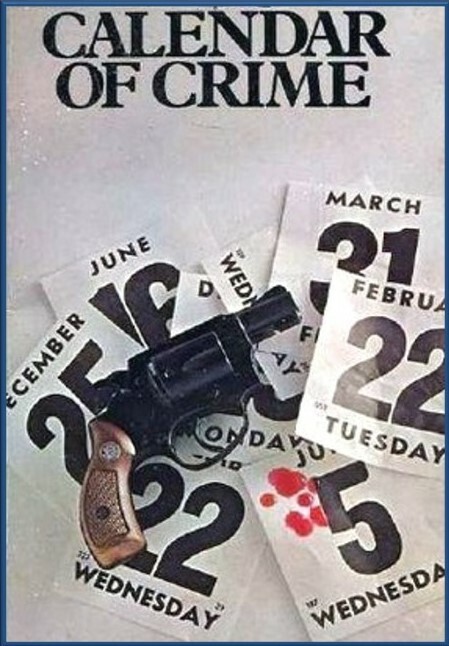 It was also the first historically-based mystery that I ever read. I have to admit that at the time I read it (as a preteen) I wasn't a particularly well-versed in British history. I was aware of Richard III and that he was supposed to have done away with his nephews, but that's about it. Not unlike most of the characters in Tey's book. The nurses and the doctor and those who visit Inspector Alan Grant all have been raised on history books (and Shakespeare) that portrayed Richard as the evil uncle who ruthlessly killed off two children so he could be king. That first reading--I was absorbed in Inspector Grant's historical detecting, an activity he takes up when he is forced by an accident to stay in hospital for what seems by today's standards an inordinate amount of time. He's found every pattern possible in the ceiling above him. He's tried all the books his friends have brought him and found them wanting (the books, not the friends). He's bored out of his mind in the world of the 1950s with no in-room television, no phone, no laptop or cellphone to play on all day. Until his friend Marta brings in a bundle of postcards with faces/portraits on them and suggests he do a bit of detecting. Each picture represents a famous "mystery." Grant is quite taken with one particular portrait of a sensitive and noble-looking man. Before he turns it over to see whose portrait it is, Grant--known for his ability to sum people up by their appearance--tries to determine if the man belongs on the bench or in the dock and comes down firmly for the bench. He's very surprised to discover that he is looking at Richard III and begins to doubt his abilities. But, then, none of the people to whom he shows the portrait identify the man as evil--some think he looks like he's suffered; the doctor suggests that the man has a childhood illness; Grant's subordinate agrees that the man looks judicial. It's only after they are told that it's Richard that any of them decide, "Oh, yes. Now I can see the evil/greed/baseness in his face." Grant becomes so interested in Richard that he gets Marta to find him a researcher at the British Library and together Grant and Brent Carradine go on a historical journey to discover the real Richard. The aim is to find out what made a man who looks like Richard turn into a child-murderer. But what they discover is that history is written by the victors and that there is much to doubt about the official story. Richard was a good steward, a brave soldier when necessary, and loyal to his brother, the King. There is little evidence that he was the greedy, grasping man history had painted him. In fact, there was evidence that he was a popular King during his brief reign. So, what really happened? If Richard didn't kill the Princes in the Tower (or have them killed), then who did? It was a bit disappointing to find out at the end of the book, that none of Grant and Carradine's discoveries was big news--that historians already knew that there was doubt about Richard's guilt. It's a shame that Tey (and fictionally, Carradine) wasn't able to produce this bombshell and set everyone right. But--after getting over that--it was interesting to look at the ways police detection and historical research are similar. Some of the same questions that benefit Grant in his modern cases (Who benefits? What was everyone doing at the time? etc) were integral to discovering the mysteries of the historical case. Of course, trying to find answers hundreds of years later is a little more difficult. But good research and know what documents to examine for answers go a long way. This second reading* was just as entertaining as the first--even though I already knew what they found out and that it wasn't the big bombshell discovery that Carradine (and I) thought it was. I paid more attention to the research methods and the details than I did so many years ago. I enjoyed the little discoveries--the pieces found in letters and brief mentions in historical accounts that help them build their case for Richard's innocence. 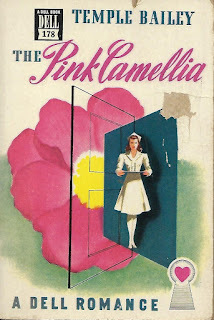 Not strictly speaking a straight detective novel, but it definitely helped get me interested in historical novels and in finding more Josephine Tey mysteries. ★★★★★ then and ★★★★★ now. 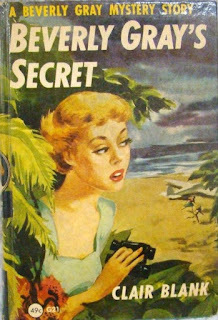 Beverly Gray's Secret (1951) is the 21st book in the series by Clair Blank. Unlike the Nancy Drew series, Clair Blank was a single author who wrote all 25 books in the series. 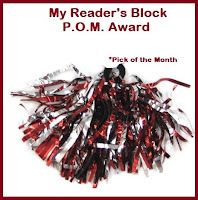 The books begin with Beverly's freshman year in college and follow her from there through various adventures, work for the government, and finally as a newspaper reporter. YOUR SERVICES NO LONGER REQUIRED. She's certain there must be a mistake and requests confirmation by return telegram. When the answer comes stating that there has been no mistake. She and her fiance Larry fly back to New York so she can demand an explanation in person. After getting no better answer from Blaine in person, she clears out her desk and leaves the building--still very upset and confused. But Blaine meets her at her car and explains that he needed her official connection with the paper to be severed so she could take on an investigation for him. Blaine wants her to go to Florida and get to the bottom of counterfeiting accusations which have been leveled against the son of one his friends. He fervently hopes it's not true, but if it is, he want's Beverly's help to find out what's really going on so he and Philip Barton's father can plan the best defense. Beverly heads to Florida and manages to get a job working for Philip's airline. The counterfeit money was found stashed aboard one of his planes. But since that discovery, his airline has faced one disaster after another--forcing him to miss delivery deadlines that could cost him his business. Her investigation leads her to believe that Philip is honest, but somebody wants to put him out of business. Is it the counterfeiters? Or is there someone else sabotaging his airline for purposes of their own? It doesn't take our investigative reporter long to get to the bottom of the problem. She not only discovers the counterfeiters, but arranges for the arrest of the saboteur as well. Beverly Gray is another heroine that I wish I had met when I was young. I would have loved reading about a detective with my own name! She's resourceful and independent and a good role model for young girls. On the one hand, she's a bit more realistic than Nancy Drew--going to work and living away from home in the big city. But then, I think she gives Nancy a run for her money in the number of close scrapes she has. She also has way more adventures than most of us do in everyday life, but the stories wouldn't be nearly as exciting without them. 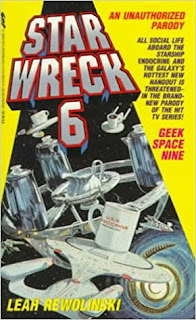 As one might suspect, Star Wreck 6: Geek Space Nine (1994) is the sixth Star Trek parody by Leah Rewolinski. And I think Leah is running out of humorous steam--either that or maybe I just don't find Deep Six Nine (er-- Deep Space Nine) as much fun to parody as other portions of the ST universe. So...maybe my bias is showing. Because Deep Space Nine is not my favorite variation on the Star Trek theme (my apologies to all DSN fans out there). This time around, an epidemic of boredom has struck Geek Space Nine--the space station's crew and inhabitants couldn't act themselves out of a wet paperbag and their stories are not selling to the Universal Enquirer the way they used to. This means that tourists are avoiding the place like the plague. Starfreak Command who has poured way more money into the pricey dump than they should have cannot let the tourism numbers drop any further and so the crews of both the original USS Endocrine (under Captain Smirk) and the flashy, updated USS Endocrine-D (with Captain Ricardo) are sent to the strategic Gummi-Quardrant station to find a way to plug the tourism drain. But the troubles aren't over when the starships arrive--in fact they multiply. Because Endocrine crew members start disappearing right and left into the mysterious Talent Void. Commander Dacron risks losing what little personality he has and heads into the Void to bring back the missing officers. Will he be in time? Will they find a way to reverse the effects? Will they then be able help the Geek Space Nine folks get their space station mojo back? In Another Woman's House (1947) by Mignon G. Eberhart, our heroine, Myra, has decided that she must leave the house she has lived in for several years as well as her beloved guardian, Miss Cornelia. She has fallen in love with Richard Thorne, the owner of the house and Miss Cornelia's nephew, and that will never do. For Richard is married. It doesn't matter that Richard's wife isn't home any more--Alice Thorne was convicted of murder and sent to prison. Myra knows that Richard's code of ethics would never allow him to divorce his wife, no matter what she had done. But when Myra announces her intentions to leave, she is surprised to discover that Richard returns her feelings and is willing to divorce Alice. 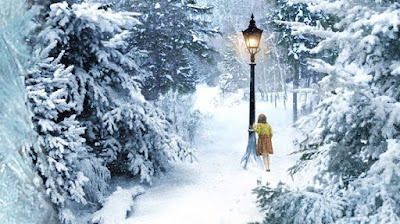 Just when it looks like the story might have an early happy ending, Alice comes back home. It turns out that the key witness in the murder trial has recanted his testimony. He had claimed to have seen Alice Thorne murder Jack Manders. But that wasn't true. And without the testimony of an eye witness, the prosecution's case has no foundation. Alice has been pardoned by the Governor (who was the prosecuting attorney) and now the police will be looking for the real murderer. I'm afraid this one isn't quite my cup of tea. I much prefer Eberhart's stories with Nurse Sarah Keate. While Sarah does often find herself in the middle of mysteries with Gothic overtones and sinister atmosphere, it's not usually as brooding as this And the core mystery plot is usually handled much more adeptly. I found my attention wandering as Myra made her way through all the sinister forebodings in the house. And it was quite clear from the moment Alice came back who the murderer was. There was no mystery about it all. The suspense that was supposed to build while we waited to see if everyone in the book would figure out who the culprit was....well it just didn't. Build that is. I was pretty frustrated that it took another death before Myra figured it out and then it looked like the culprit was going to get away with it anyway. The saving feature of the book is in its characters. Eberhart is very good at providing well-rounded characters with believable motives and psychological flaws. Her characters may behave erratically, but no more so than people do in real life. And it is precisely because you can relate these people to real life that they work. The logic of murderer? I can understand it (I may not agree with it, but I can understand it). Myra's reactions to various situations? Very believable. I can definitely see a woman of principle at that time feeling like she needs to leave rather than pine for another woman's husband. And then, when she realizes he feels the same way, she is ready to fight for their love--even if she has to fight a murderer first. ★★ and 1/2--which could have been a solid three if the mystery hadn't been so transparent. 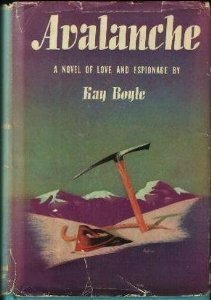 Avalanche (1944) by Kay Boyle is an espionage story with romantic overtones set in France during the German occupation. It follows Fenton Ravel, a French-American young woman who has returned to France from America. She is in search of answers about the disappearance of Bastineau, a man she grew up with and whom she grew to love. It is said that Bastineau died in an avalanche, along with two men he was guiding in the French Alps, but Fenton refuses to believe that he is dead. As she makes her way to the mountains where she grew up, she doesn't realize that there is someone else on the darkened train who also searches for Bastineau and the secrets his disappearance hides. The locals are suspicious of her, in part because she is viewed as having abandoned France (for America) when war was rumbling on the horizon. Now that she's back, she is seen in the company men suspected of being spies and the villagers are fearful that the secret work of the resistance will be revealed--either deliberately or inadvertently by her return.Will she be able to help the man she loves...or will she unknowingly lead the enemy to him? This is an average romance and an average spy story. Fenton is, unfortunately, a fairly stupid heroine. It takes her an inordinately long time to spot the bad guy of the piece (despite Boyle using near-neon signposts pointing to him) and still manages to lead him to the truth about Bastineau and the resistance movement that he's still working with (yes, he's alive). Fortunately for her, our hero arrives in the nick of time to save her from the German spy. And they get married (monsieur le curé just happens to pop in at the right moment) and they go happily off into the sunset to fight for the resistance together. 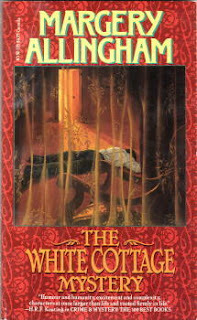 The best parts of this one include the opening scenes when Fenton is on the dark train with two other travelers--they sit in the dark compartment because of the black out. They are all curious about one another, but endeavor to hold a casual conversation that will not betray their curiosity. It's quite well done. 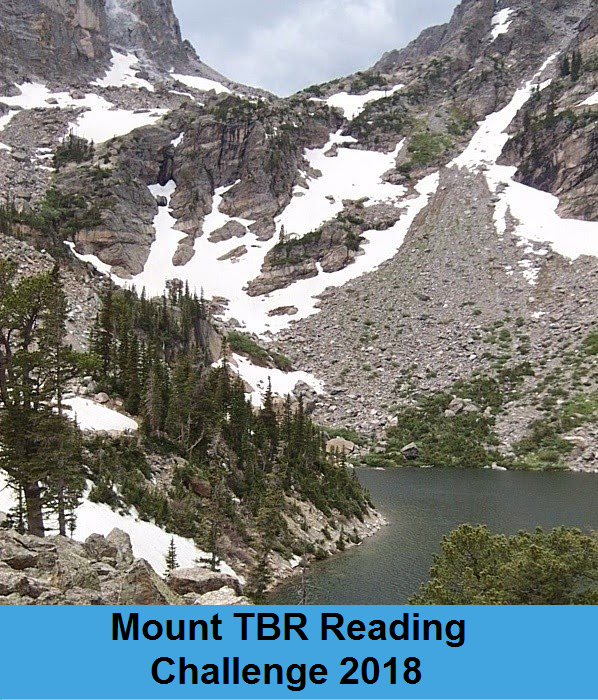 Boyle also does well with her descriptions of the gray and white mountains, invoking brooding imagery that gives readers a good sense of the landscape. I think perhaps Boyle would have done better as a straight fiction writer. She doesn't quite have the flair necessary for a suspenseful spy thriller. ★★ and a half. 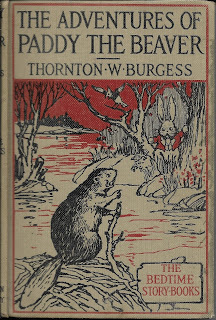 Thornton W. Burgess used his animal tales to educate children about the ways of animals and teach life lessons. The amusing stories of various creatures of the forest make for charming tales that are so fun and interesting that the children of yesteryear may not have even noticed that they were learning a few things. 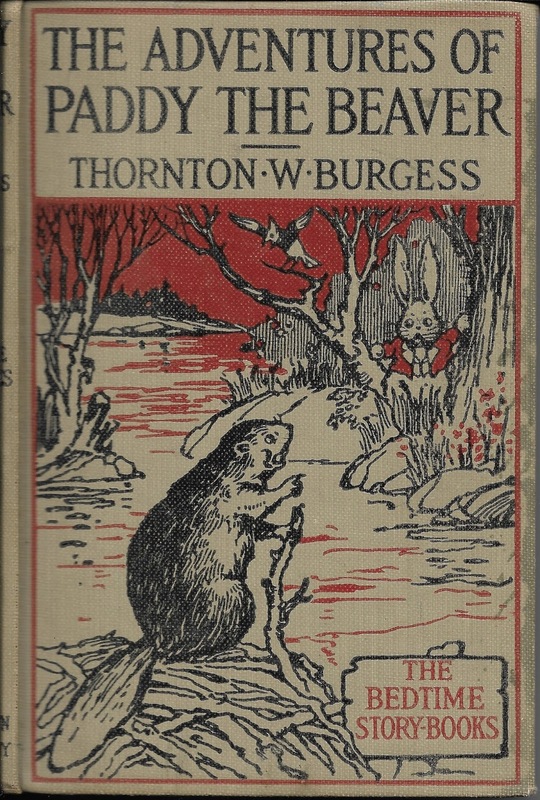 Burgess's The Adventures of Paddy the Beaver (1917) is no different. Paddy moves to the Green Woods and sets about making a home for himself. First he must build a dam and create a pond big enough to hold his lodge. All the creatures who live in the wood are curious about their new neighbor and come to watch him work. His cousin Jerry Muskrat doesn't understand his building methods and is quite sure he's doing it all wrong. But nothing bothers Paddy--not even Ol' Mr. Coyote who stalks the banks at night hoping for a tasty beaver sandwich--and soon they all find out what kind of builder Paddy is. ...when Paddy begins work, he sticks to it until it is finished. He says that is the only way to succeed, and you know and I know that he is right. So now he knew just what to do and the best way of doing it. You know a great many people waste time and labor doing things the wrong way, so they have to be done over again. They forget to be sure they are right, and so they go ahead until they find they are wrong, and all their work goes for nothing. You see, Paddy was much bigger than most of the little meadow and forest people, and they didn't know what kind of a temper he might have. It is always safest to be very distrustful of strangers...So now he was perfectly willing to go right on working and let his hidden visitors watch him until they were sure that he meant them no harm. He also teaches children about friendship. Showing them that (in the case of Sammy Jay), the best way to have a friend is to be one. Alleyn and Bailey were on their knees by the prompt box. 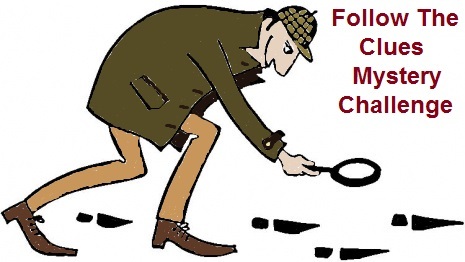 Bailey was busy with an insufflator and the inspector seemed to be peering at the floor through a magnifying glass. Beside him, opened, was the bag they had brought him from the Yard. Nigel looked into it and saw a neat collection of objects, among which he distinguished magnifying glasses, tape, scissors, soap, a towel, an electric torch, rubber gloves, sealing wax, and a pair of handcuffs. "What are you doing?" asked Nigel. "Being a detective. Can't you see?" So--back to the review. Inspector Roderick Alleyn's journalist pal Nigel Bathgate is friends with Felix Gardener, leading man in the up-and-coming London play The Rat & the Beaver. Felix gives Nigel two tickets to a second week performance and, since Nigel's best girl is out of town, the journalist decides to ask Alleyn if he'd like to join him. In the play, Gardener plays the Rat who "shoots" his fellow actor Arthur Surbonadier (aka the Beaver). The gun is normally loaded with dummies--not just blanks, because the shooting takes place at close range and would still ruin Surbonadier's costume. But tonight--somebody has replaced the dummies with the real thing and Surbonadier's death scene becomes the final performance of his life. Off-stage, Surbonadier is the nephew of the theatre owner, but even his relationship to the owner couldn't give him the part he coveted--that of the Rat. The rivalry between the two men wasn't limited to their roles, however. They were also rivals for the attentions of the leading lady, Stephanie Vaughn. So, when murder happens, it's not too surprising. But everyone in the play would have been less surprised if Surbonadier had shot Gardener--after all, he thought Gardener had stolen his part and the affections of the actress. And the disgruntled actor was more the murderous type than the well-liked Gardener. But did Gardener load the pistol with real bullets? Or did someone else do the switch and let Gardener do their dirty work for them? That's what Alleyn will have to determine. And it soon becomes apparent that plenty of people had good reason to want Surbonadier out of the way--everyone from his rival to the props man to his own uncle to the other actress he had made advances to. But who had the nerve...and the opportunity...to make the switch and change a prop into a real murder weapon? Marsh's second novel is as entertaining as the first. Having such a love and interest in the theater, she provides a very realistic portrayal of the quirks and foibles of the actors, actresses, and sundry supporting backstage folk. Bathgate is a bit more annoying in this one--primarily because his friend Gardener is in the hot seat. I was relieved to see that Inspector Fox plays a larger role and I look forward to future installments when he will play "Watson" to Alleyn instead of Bathgate. Alleyn is also more flippant (and, at times, bordering on ridiculous) this time out, particularly in the beginning, but his character seems to settle down towards the end. I will be interested to see how Marsh presents him in the third novel. 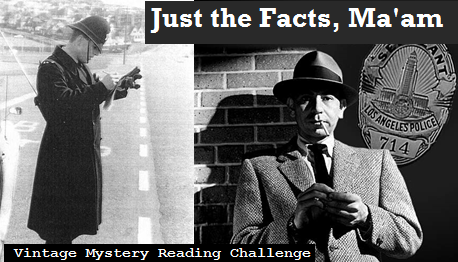 Over all January was a pretty average month for mysteries. Three of the fiction offerings brought in three and a half stars and poor Sherlock only managed two stars in the Davies pastiche. 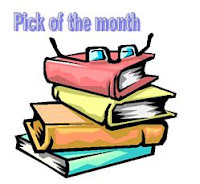 Our big winner for the month was Martin Edwards's reference book which highlights the rise and duration of the Golden Age novels, gives synopses and background for 100 of them, and name-drops scads of others. 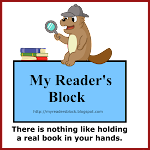 I naturally love any resource that will tell me more about my favorite genre and period--especially if it tells me about books I didn't know existed. If Martin hadn't already snagged a nonfiction P.O.M. award for his The Golden Age of Murder, we'd definitely be throwing more bouquets his way this month. 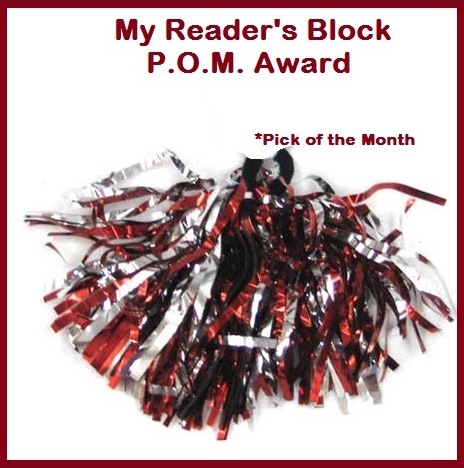 But that doesn't help us with our fiction P.O.M. award. A Man Lay Dead, Marsh's debut novel, is a classic Golden Age novel featuring a country house murder. 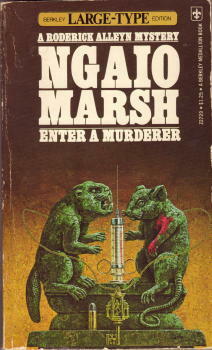 It was my first experience with Marsh and it was also the first novel I ever read with the "murder game" as part of the plot. But I realized upon this reread that while the country house setting and the murder game was good, Alleyn's character is lacking a bit here and I definitely missed Inspector Fox as his right-hand man. I'm working my way through the first 12 Alleyn novels for a challenge this year, so hopefully we'll be able to call Ngaio Marsh's name for P.O.M. honors sometime in the near future. But not this month. 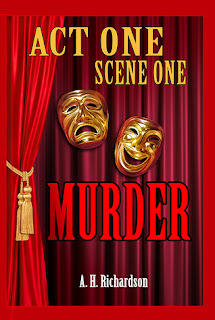 Act One, Scene One--Murder is another mystery by A. H. Richardson in a series that models itself on the Golden Age. The setting is post-WW II Britain, but it seems more at home in the years between the wars. There are big, sprawling country houses with staff to wait on guests. There is a very proper British butler at Sir Victor Hazlitt's aunt's house. House parties and Golden Age manners and the pre-cell phone and pre-computer era. It makes for a very enjoyable read and the plot has some interesting twists and turns to keep the armchair detective guessing. I also really enjoy our trio of heroes. Their interactions and their individual sleuthing styles make for an interesting mystery. Unfortunately, I had enough quibbles with the fair play aspect that I just don't see this one as our winner either. I have to admit to being thoroughly bamboozled by the plot. I thought for sure I had seen my way around one of the difficulties...only to be proved wrong. I do think the ending is a bit of a cheat, but it is still a thoroughly enjoyable light and breezy example of the early detective novel. It has just that hint of romance in it--that doesn't overpower the mystery plot. A short, quick read that was just right to kick off the new year. 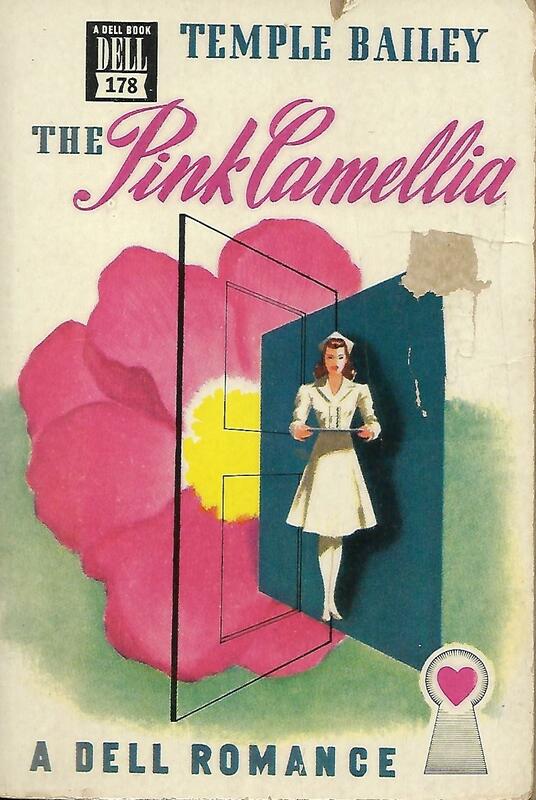 The Pink Camellia (1947) by Temple Bailey is a wholesome little American romance. Cecily Merryman heads east from Arizona to take up a position as companion to the fussy Mrs. Marburg--in an effort to escape the romantic overtures from Peter Chilton. Chilton is a handsome bestselling author who models himself after the heroes of his novels. But Cecily thinks he over-dramatizes himself and knows she could never be happy with a man who takes her devotion for granted. She looks forward to helping her new employer, but doesn't expect to find herself in the middle of a real life overwrought drama. Mrs. Marburg was once a great beauty, but since her husband's death she has become fussy, fearful, bitter, and more and more under the thumb of her secretary Mark Keating. Mrs. Marburg has pushed away most of her friends and trusted servants--at the instigation of Keating--while keeping her son Blair tied firmly to her apron strings by keeping him in line through finances. Cecily has walked into a den of suspicion and high emotion and things are made even more complicated when she falls in love with Blair--a man already spoken for by the lovely and flighty Gypsy Tyson. Blair is also drawn to the newest member of his mother's household...but a twist of fate in the form of an airplane accident may tie him to Gypsy forever. Will Cecily wind up with the man she loves--or will she have to settle for Peter (who is sure she'll miss his charms eventually)? And will Blair find a way to rescue his mother from the grasp of the deceitful secretary? 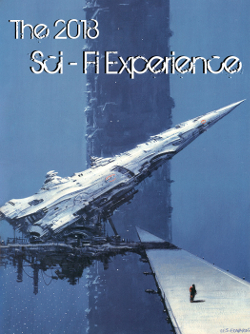 I was so glad to see that Carl V over at Stainless Droppings put up a notice about his Sci-Fi Experience reading event in December-January. I wish I had seen it at the beginning of the month instead of the end--but my life has been pretty hectic and I missed it. 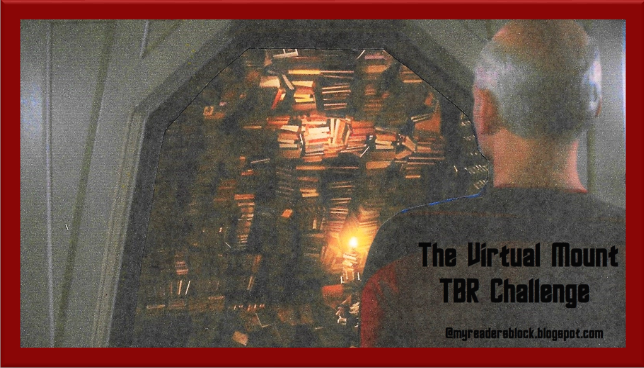 So...I'm going to line up my SF TBR stacks so I can join Carl as well as participate in the Vintage SF read in January. I'm going to plan on reading four even though Carl puts no pressure on us to meet certain levels. 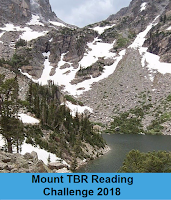 I met my personal reading goal! Once upon a time, I wanted to read more old stuff. I wanted to know more about where science fiction had come from, how science fiction authors reacted to what had come before them, and how science fiction reflected societal trends. Our fiction can be a reflection of our society, don’cha know. That year, I decided I would read only Vintage Scifi during the month of January, and I arbitrarily decided anything from before 1979 would be Vintage, because that was the year I was born. Some people went with the 1979, some people went with whatever year they were born, some people went with something else. As with every bloggy thing I do, there were no hard rules. The goal was to read something “older” and then talk about it online. 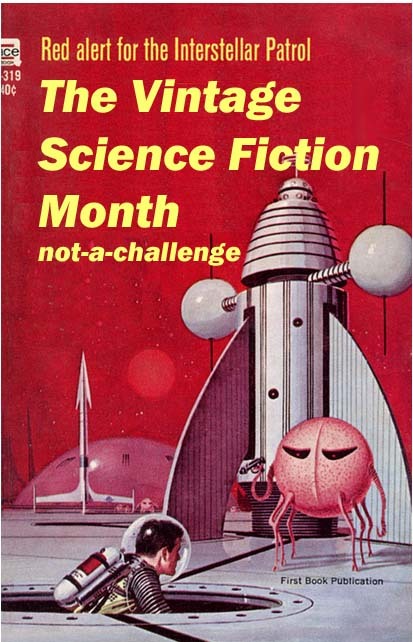 #VintageSciFiMonth is now a thing. It’s so big, I have a co-host, Jacob at Red Star Reviews. He runs the @VintageSciFi_ (underscore at the end) twitter feed. 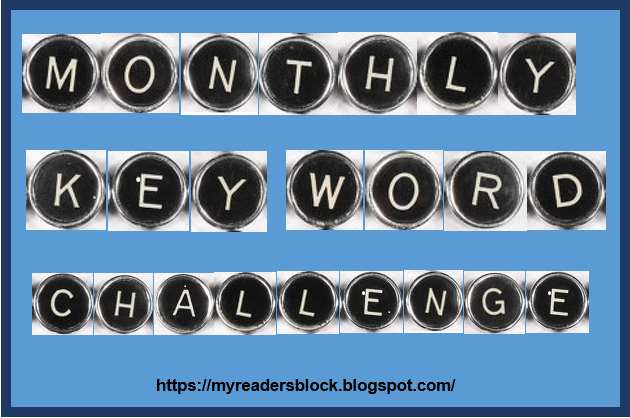 I always set a personal goal to read four books. Four books done! 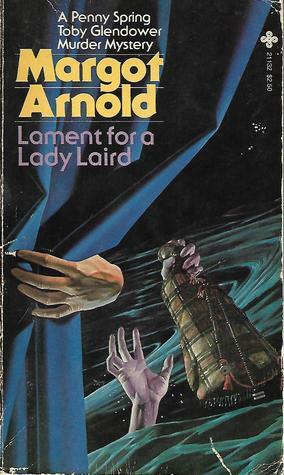 Lament for a Lady Laird (1982) by Margot Arnold is part of the continuing adventures of PennySpring, anthropologist, and Sir Toby Glendower, archaeologist. Penny has received a letter from her old friend Heather Mcdonnell inviting her to visit her at the Scottish castle she has recently inherited. It's somewhat fortuitous because Penny has been trying to figure out what she will do with her summer vacation time--but she also wonders what she might be getting herself into as she picks up a strange sense of urgency from Heather when she calls to discuss the visit. Upon arrival at Soruba House, she discovers that either Heather's new home is well and truly haunted or someone is determined to scare the new Lady Laird away. It's hard to figure out why, though. The castle had lain empty for some time while the attorneys tracked down the "lost" heir to the Mcdonnell seat, so surely if there was anything in the castle worth getting it would have been strategic for the "ghost" to get it before the new Laird's arrival. Things get even more mysterious when the Laird of the neighboring land, Amy McClintock, is found dead from an apparent drowning after she fails to arrive at a dinner meant to introduce Penny to the locals. Penny feels a bit lost without her partner in detection and asks Heather to invite Sir Toby to stay as well. Now Penny, Sir Toby, and Heather's niece (recently arrived as well) must search for clues to see if the McClintock was the true target or if she discovered something dangerous about Heather's "ghost." There's little archaeology going on in this one--but there are ties to the past that will explain the crimes of the present. Another solid ★★★ entry in this series. It's not an intricate puzzle, but a nice cozy little mystery with good characterization and an interesting detective duo with a fun relationship--full of banter, almost like an old married couple. The only draw-back on the mystery side is that while the reader might suspect who's behind the murder and the "haunting" and have a vague idea about the motive there really aren't enough clues to determine the actual, real live reason. I certainly wouldn't have guessed (and didn't) that [hidden by light font to prevent spoiling--highlight to read] plutonium that went down in the water with a crashed plane was the final objective of the culprit. There weren't exactly any clues pointing to that. 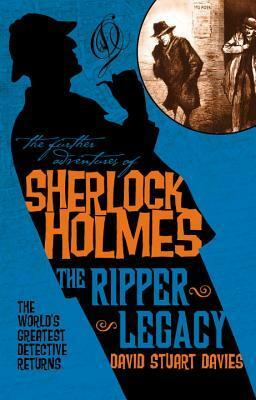 The Further Adventures of Sherlock Holmes: The Ripper Legacy (2016) by David Stuart Davies takes place not long after Sherlock Holmes has returned from his "demise" at the Reichenbach Falls. 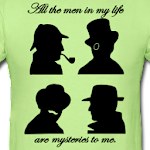 It involves Holmes and Watson in a kidnapping case that has baffled the authorities. Young William Temple wandered away from his mother and his nanny while at Kensington Gardens. The women lose sight of him near the Round Pond and the next they see him, he is in the distance--being dragged from the park by two men. Charlotte Temple did not get a good look at the men and there has been no ransom demand, so the police have had no luck tracing the boy. Holmes himself hold out little hope to the distraught parents, but promises to do his best. Gradually, he discovers slender clues that lead him from the Temple's upper class home to a disreputable orphanage to the dark alleyways of White Chapel. Those clues also lead him to suspect a connection with the unsolved murders of Jack the Ripper and his investigations into the child's true heritage reveals a plot meant to shake the very foundations of Britain. With Watson at his side, he must face a formidable foe hiding beneath the Tower Bridge. The Ripper Legacy is a bit of disappointment. While Davies does get the atmosphere of Victorian England right and has a good grasp of the Holmes/Watson relationship, he really doesn't provide much that is new in the Ripper connection--except to produce a very unoriginal motive behind the murders with a very tiny twist--and he trots out a very tired Holmes pastiche trope. And--like others who have reviewed this on Goodreads, I was not enamored with the multiple viewpoints. It's a Holmes story--let Watson tell it; don't keep bouncing us around from Watson's diaries to the kidnappers to the people behind the kidnappers to Mycroft and back again. Anyone with much knowledge of the Ripper killings has to know that Prince Eddy has featured as a possible suspect or behind-the-scenes player in the horrific murders. And I get very tired of the resuscitation of Moriarty. Seriously--it's enough suspension of disbelief to accept that Holmes survived that meeting at the Falls. To have Holmes watch Moriarty plunge into that chasm (per the canon) and then bring him back to life (in various ways by various authors) is a bit much. I honestly would have enjoyed this one more if he had done something new and interesting with the Ripper story line instead of rehashing previous theories and a much-used Holmes pastiche plot device. ★★ --for the atmosphere and Holmes/Watson dynamic. 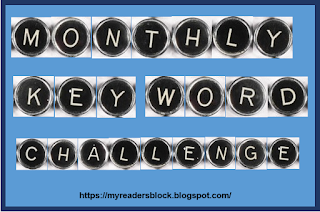 I really liked seeing your covers during the scavenger hunt challenges, so I'm keeping the picture style link up for reviews. Act One, Scene One--Murder (2016) by A. H. Richardson is the second novel featuring Inspector Stan Burgess, actor Berry (Beresford) Brandon, and Sir Victor Hazlitt. This time the trio gets involved in murder when Berry is cast for a part in a brand new play and someone decides to to poison the leading man when the cast gathers at the playwright's country home for a party that's supposed to smooth troubled waters. [Obviously that worked well....] And there was all kinds of trouble in the water. Judson Morgan was definitely not well-loved. Not even by his wife, Carlotta Raffael, who costars in the production. She has quickly determined that marrying Morgan was a mistake, particularly given his womanizing ways. The rest of the cast, the director, and the playwright have all had a less than harmonious relationship with the star--either during rehearsals for the play or sometime in the past. It appears that determining who didn't have a reason to murder Morgan would be a much easier question to answer. But then another murder occurs and Burgess, Brandon, and Sir Victor must decide if they have even been asking the right questions at all. Richardson's stories have a definite Golden Age feel. The setting is post-WW II Britain, but it seems more at home in the years between the wars. There are big, sprawling country houses with staff to wait on guests. There is a very proper British butler at Sir Victor Hazlitt's aunt's house. House parties and Golden Age manners and the pre-cell phone and pre-computer era. It makes for a very enjoyable read and the plot has some interesting twists and turns to keep the armchair detective guessing. I also really enjoy our trio of heroes. Their interactions and their individual sleuthing styles make for an interesting mystery and a ★★★ and a half rating over all. I have just a few quibbles that keep this from a full four-star rating. First: coincidence takes the action back to the area near Little Shendon (scene of our heroes' first adventure). But there's really no good reason for this other than we decided to give Mr. Symeon, the playwright, a huge old house there. We don't even make much of Sir Victor's aunt in this story--her house serves as not much more than a hotel where Sir Victor can spend the night. Lady Armstrong is such a colorful character; it's a shame that she doesn't play a more integral part (especially since we took all the trouble to have the murder take place in her neighborhood, so to speak). Second, while Richardson does make a great effort to follow in the footsteps of the Golden Age (with much success in a number of ways), I can't say that the plot is completely fair in its cluing. It is possible to spot the culprit, but I don't think the clues really explain the motive. There are hints, yes, though tiny. But looking back, I don't (as is often the case with Christie and others) say "Oh, yes, when so-and-so said that, I should have known that X needed to get rid of Y because Z." At the end of the book, we know that X needed to get rid of Y because Inspector Burgess received a packet of information from the Yard that told him so...and he doesn't tell us until after the culprit has been hauled away and we're having our little wrap-up scene. My last quibble is the same as with the first book. In fact I can pretty much lift the words from the previous review: "the formatting is distracting. It is formatted with double-spacing between every paragraph. Absolutely unnecessary in a novel and it breaks up the page as well as the reading flow. It's as if it was decided ahead of time that we MUST have at least 270 pages [in this book] using this particular font size and, by golly, if we've got to double-space to get there, then we will." And, again, the paragraphs are, generally speaking, very short. The combination makes the book feel choppy. It's a bit better in this second outing, but still a distraction.